Time bound service delivery in the state should be ensured under Right to Service Act so that precious time of general public should not be get wasted. This was stated by Chief Commissioner Punjab Service Commission Sh. S.C.Aggarwal while reviewing the working of Sewa Kendera at Lohgarh (Zirakpur)Sh. 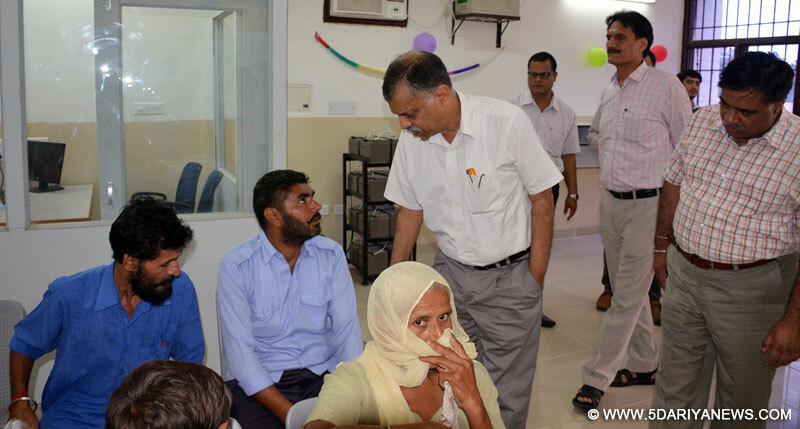 Aggarwal said that the Sewa Kenderas established by Punjab Govt. will be a blessing for the general public which will help public for their works relating to Govt. departments. He said that 322 Sewa Kendras has been established in urban areas, whereas the Sewa Kenderas established in rural areas will be made functional at the earliest. During this Sh. Aggarwal interacted with Mr. Harmeet Singh resident of village Dialpur Sodhian who came here for Punjab Domicile certificate and also interacted with other people for which they expressed their satisfaction regarding the services being offered by the Sewa Kenderas.During this Deputy Commissioner Sh. D.S.Mangat urged that people should take maximum benefits from these Sewa Kenderas and said out of 31 Sewa Kenderas 16 has been established in Tehsil Dera Bassi, 5 at Mohali & 10 at Kharar.During this Secretary Punjab Legal Services Sh. Jaspal Mittal, SDM Dera Bassi Sh. Shiv Kumar, Naib Tehsildar Sh. Paramjeet Singh and other officers were also present.